Fazer Taloussuklaa baking chocolate introduces a twist of chocolate to your kitchen. This dark chocolate will melt the heart of the baker and all chocolate lovers. You can use the dark chocolate in baking or eat it as it is! (GB) Chocolate. Ingredients: sugar, cocoa butter, cocoa powder, MILK FAT, emulsifier (lecithin incl. SOYA), flavouring. In chocolate cocoa solids 44% minimum. MAY CONTAIN TRACES OF MILK, NUTS, ALMONDS AND WHEAT. 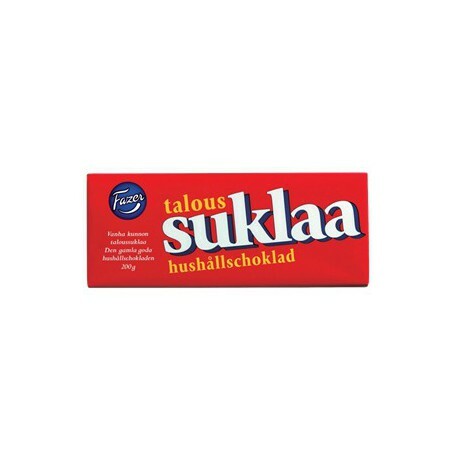 Producer: Fazer Confectionery, Finland.